TurboCAD offers tools to make architectural design easier. Features on this page are include in TurboCAD Pro Platinum, TurboCAD Expert, and TurboCAD Deluxe unless otherwise specified. TurboCAD architectural objects are all fully parametric, meaning that all geometric (i.e. height, width, depth) and style (shape, type, material) attributes can be easily adjusted when the object is selected. TurboCAD self-healing walls automatically join and intersect as you design in 2D or 3D. Quickly create straight or curved walls. Get automatic openings when placing doors and windows. View wall dimensions with a single-click. 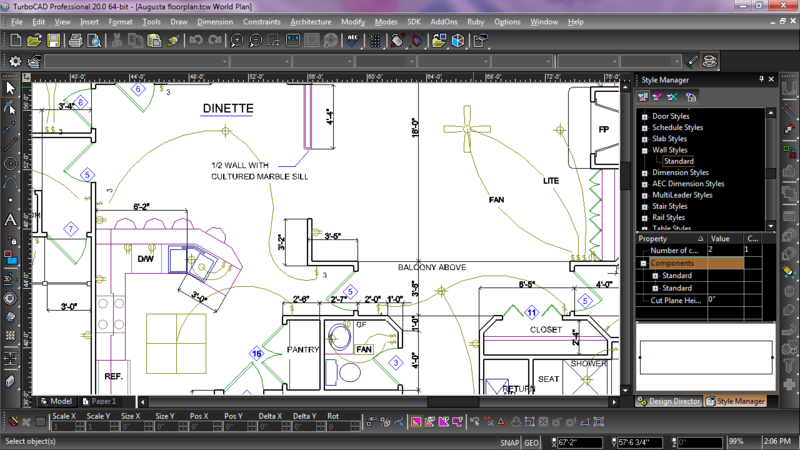 When exported as an .DWG file, walls are compatible with AutoCAD® Architecture and and AutoCAD Architectural Desktop. TurboCAD also offers ACA/ADT compatible parametric doors and windows. The basic types and styles come with TurboCAD Deluxe and Expert, while TurboCAD Pro Platinum offers additional types and shapes, including 18 door types, 6 door shapes, 13 window types and 13 window shapes. Plus, you can apply door and window muntins. TurboCAD offers the ability to create straight stairs in as little as 3 clicks. Stairs are fully parametric. Specify material, stair dimensions including height, and more. TurboCAD Pro Platinum offers additional parametric stair object styles including multi-landing, spiral, and u-shaped. Insert self-incrementing markers to number objects such as rooms, doors or windows in your architectural plans. Great for creating legends, call outs, or simply mapping points and adding notes to your drawings. Four different marker styles are included. Create any custom block, like a revolving door or column, and place it into a wall object. The block will automatically clean-up (trim or heal) and correctly align when placed, moved, or removed from a wall.